Runners at different courses on Friday with Zume Forward and Walton Hall at Bendigo followed by Top Of The Range and Pedro Ximenez in the same race at Moonee Valley. Zume Forward is the first to go in the third race, the Fillies and Mares Maiden Plate over 1300m with Jake Noonan to ride. The three-year-old had legitimate excuses for finishing eighth at Cranbourne over 1600m at her last start. “I’m happy to run her as long as the forecast rain doesn’t arrive as she’s not at her best on wet ground,” Mike Moroney said. “It doesn’t look the strongest race so I’d like to run - she’s drawn out a little bit but I’m confident she has enough speed to get across. Walton Hall is in race four, the Maiden Plate over 1400m with Jason Benbow to ride from barrier three after missing a start earlier in the week due to the weather. The Ad Valorem three-year-old pleased Moroney with his debut fourth over 1450m at Kyneton on January 16. “His work has been really good although this does look a tougher race than the one he missed,” Moroney said. “I wanted to put Jason on for his left handed ride to counter his habit of laying in. Pedro Ximenez and Top Of The Range are in race six at Moonee Valley, the Chinese New Year Cup over 2500m with Ben Melham aboard Top Of The Range and Michael Dee on Pedro Ximenez. “We’ve put Michael on for his left handed ride to help him,” Moroney said. “He’s been up a while but is handling it well and he’s had a bit of time between runs. Top Of The Range (pictured) will jump from barrier nine. 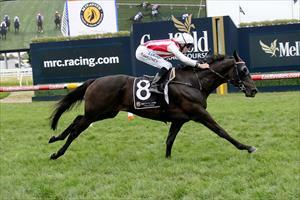 “He’s in terrific order and if he puts his best foot forward then I’m expecting him to be hard to beat,” Moroney said.